As dog owners, we’ve come to accept that we gave up having a stylish, coordinated home the moment we brought our dogs home for the first time. The nose-prints on the lower halves of the windows, the stashes of treats and food, the menagerie of colorful, slightly stinky dog toys – no, they don’t “go,” with the decor, and we’re just fine with that. That’s why the Design Paw Arched Flexi Gate is an unexpected gem. It’s one of the few pet products that complements modern furnishings. With this pet gate, you could totally get into Home & Garden Magazine. It opens the possibility of having a gorgeous home and a family of adorable animals. The black steel construction gives this pet gate plenty of heft. If properly mounted, it should contain most rowdy dogs. Matilda is too small, and Cow, too lazy, for me to truly test the limits, but I can tell it’s sturdy and well-made. The door latch has two sliding buttons that you have to pull forward in order to open the door. This means it would be impossible for a dog to open it with their nose from one side. The New Zealand pine panels are beautiful. They make the gate coordinate with wood accents in your home. Tighten the knob to secure the gate into desired position. Pet gates are essential for keeping dogs from dashing when the front door is open. In the past, I’ve written about using training to teach door manners to escape artists. Training takes time, and it won’t work if you don’t have management in place first. If your dog is able to escape, the adrenaline-fueled joy of running out into the street will always be more rewarding than anything else. At the time of writing, I didn’t have a pet gate. I didn’t have a straight hallway or entrance, so there was no way to install a traditional pet gate. So many other dog owners struggling with door dashers have the same problem. Without a way to use a pet gate, management can be nearly impossible during the training phase. What makes the Flexi Pet Gate from Carlson Pet different is how it can be set up in extra-wide, totally unusual entrances and passageways. The three panels can be arranged in a curve or zigzag to create a perfectly shaped barrier. 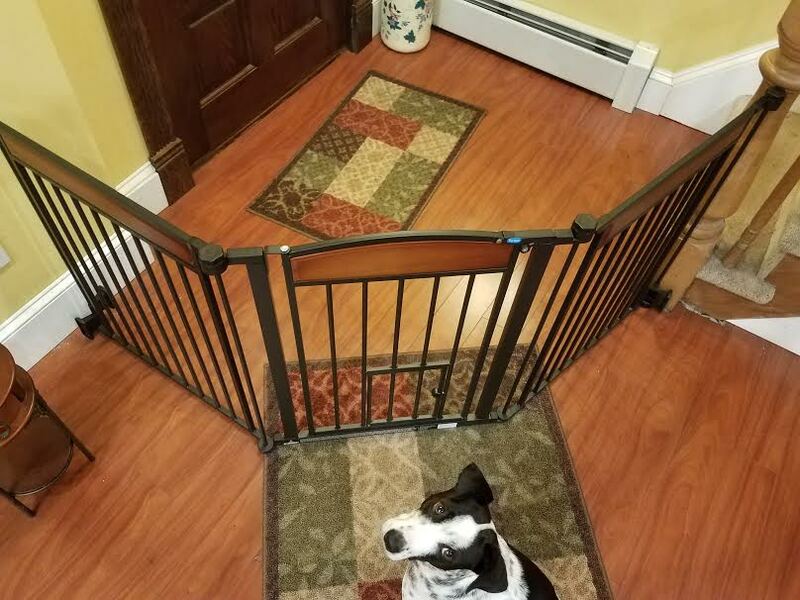 Throughout the 10 years in which I had my childhood dog, my family used a variety of pet gates. One was pressure mounted. Another, screwed into the wall. Those were always in the way. We had to step over them, which was painful if you didn’t step just right. Another was freestanding, and could be pushed aside. That one was a joke. The dog nosed right past it. So, you can imagine my delight when I discovered Carlson Pet gates have a walk-through door. Just lift the latch and walk through. This particular gate is just short enough that I can step over if I’m feeling adventurous, but that’s totally unnecessary. What’s even more delightful is the tiny pet door built into the larger door. It allows you to let your small pet walk through without your bigger animal getting in the way. I don’t use the mini door too often, as my dogs are always together. But it would be great if I had a cat that needed to get away from the dogs. I mostly use the mini door out of whimsy – it’s truly adorable. It will come in handy for winter walks. My dogs get way too excited when I’m trying to put their coats on. They don’t care whose coat I’m holding – they will both try to be first! So, I know I’m going to let Matilda through so I can get her leashed up and bedecked in a sweater, then I’ll use the large door to let Cow through when it’s her turn. If you have a straight entryway, this gate might not be the best choice for you. If your entryway is smaller than the gate, you won’t be able to adjust it. The Flexi Gate has mounting hardware for you to screw into your wall. If you aren’t able to, or don’t want to make holes in your wall, the gate can be freestanding. It is heavy and sturdy enough that it will not tip over. A strong or determined dog can push their way through a freestanding gate. 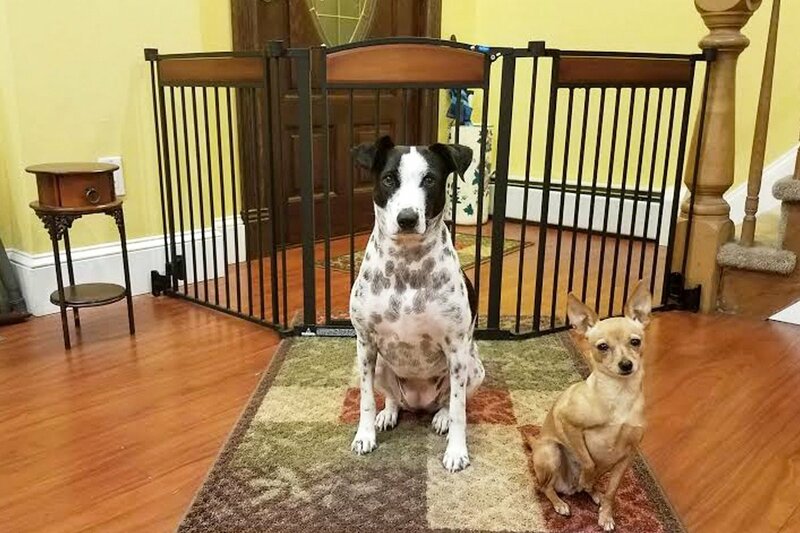 I did not mount the gate, and find that still contains my dogs. However, it will crash to the ground if you walk into it in the middle of the night. That’s really my fault for not turning the light on. If it were mounted, I’d probably be able to get my footing instead of falling flat on my face. The Flexi Gate works as it should, and doesn’t have any flaws or issues. You should, however, consider how the gate will fit into your home before making a purchase. On another note, this gate is not designed for kids. It’s made specifically for dogs and cats. You can get more details about this product on the Carlson Pet website. However, you cannot order it online. The gate cannot be shipped. You can purchase it from your nearest PetCo. Just ask a friendly PetCo associate to point you to the pet gates – it’ll be right there on the shelf! 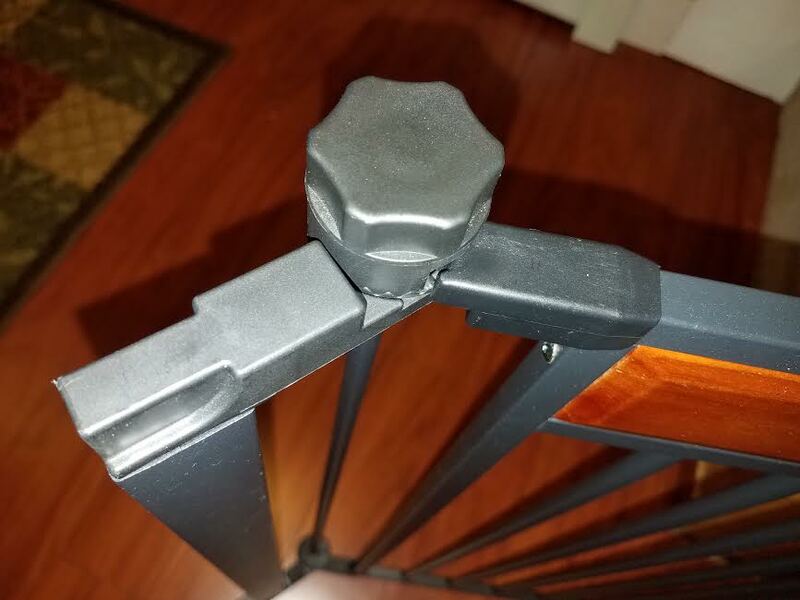 What an awesome review of the Design Paw Arched Flexi Gate. I bookmarked the link of your blog post so I can come back to it to share it with clients who may benefit from this in their own homes. I loved how you added videos into your article to help show how this gate works.